Tigers, (Panthera Tigris), the most mesmerising and glorious example of Mother Nature’s perfection, are assuredly the pinnacle symbol of India’s ecological survival. They are a “keystone” species, and therefore the hope of a future for all the other magical wildlife species that shelter in its habitat. Without these wild and free natural guardians, the remaining 13.6% of the country’s jungle covered landmass, (already alarmingly insufficient for the size of this nation’s population), will simply disappear under the axe. There is an unbearable and unrelenting amount of pressure on all India’s jungles from over 1 billion plus inhabitants, and too few people who have time to look at what is happening at the cost of the natural world and all life forms – their own included. All the other fauna are equally important to all who truly care about Indian wildlife. However, without Tigers & jungles they too will vanish from this world. 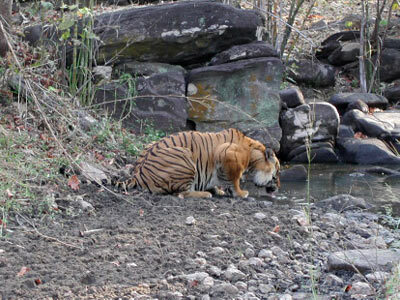 As it is imperative that India preserves what remains of its natural world, in its entirety, the Tiger’s presence is vital for the survival of all Indian fauna and flora. Tribesmen, women and children of Central India will also fade into history without the jungles - it’s their life. The jungles are a part of them, and they of this ancient, natural world. 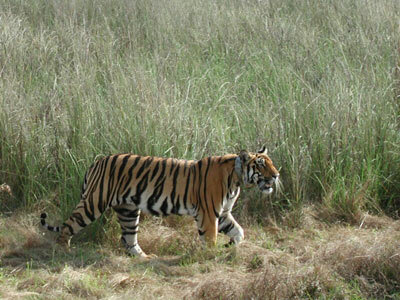 It is a sad fact that most visitors to Kanha, both Indian and foreign, come to India’s national parks to be primarily humbled in the presence of the Tiger’s magnificence. It is not only the Tigers that are under threat from poachers. Leopards, (Pantera pardus); Sloth Bears, (Melursus ursinus); Nilgai, (Boselaphus tragocamelus), Four Horn antelopes, (Tetracerus quadricornis); Spotted deer (Axis axis); and Hard Ground Barasingha (Cervus duvaucelii) are all under threat. The list is endless of what species are fading from view, or have already gone - like the Mouse Deer. However, if the Tiger disappears the survival of all other fauna will suffer further set backs, and few of the current visitors will ever think of returning. That would also be catastrophic for local employment opportunities, and for lost financial revenue & support for Kanha National Park. Visitors to national parks are often helpful to forest officials in keeping their eyes open for illegal activity in these huge, undermanned tracts of jungle. If we do not collectively wake up to the potential horrors of life without Tiger & jungles on the Indian sub-continent, we are in for an unpleasant future - for the domino effects – and there will be many and oh so horrible - are going to cause misery to all. The worst hit, and first casualties, will undoubtedly be the indigenous jungle dwellers, the Tribes, who have never really done anything evil to their environment, or to our planet. That is an injustice. It is time we collectively acted to prevent the demise of this most noble of the Creator’s life forms, and gave India’s Wildlife species a strong voice, as their voices are not heard in today’s chaos.